Have you ever had an Icebox Cake? They're one of my favorite summer desserts and only require a few simple ingredients, depending on the variety you make. If you're not familiar with an icebox cake it involves layering cookies with fresh whipped cream and letting it sit in the refrigerator overnight, so the flavors mingle together and the cookies have time to soften. When it comes to this old fashioned style icebox cakes the flavor possibilities are endless, so just go with your favorite. I made a Chocolate Chip Cookie version because that's my families favorite cookie. You can use homemade chocolate chip cookies or store bought like I used. Icebox cakes are meant to be simple, so unless I have leftover homemade chocolate chip cookies lying around store bought cookies are just as good. You can certainly bake up your your favorite chocolate chip cookies, but who wants to turn the oven on when it is 100+ degrees outside. Not me!!! 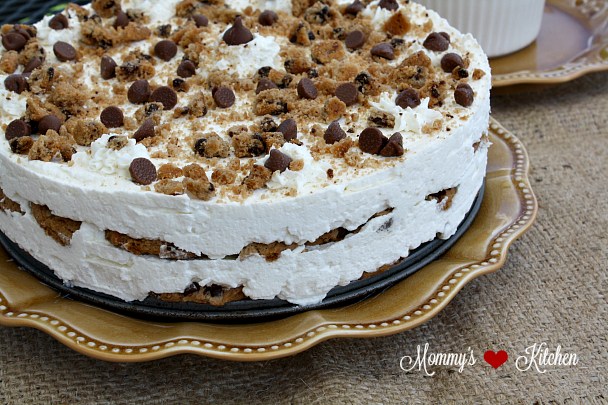 For this Icebox cake I used one package of Chips Ahoy cookies, but I recommend using two so you can add three layers instead of just two, so I adjusted the recipe to reflect two packages. I used homemade whipped cream sweetened with a bit of powdered sugar and vanilla. I don't recommend using cool whip for this recipe. It's best to use the crunchy Chips Ahoy versus the soft and chewy, because the whipped cream softens up all the cookies. I finished off the top of this ice box cake with additional crushed cookies and milk chocolate chips. That's it just refrigerate for at least 8 hours or overnight and enjoy! This icebox cake is simple to make, so let's get started (see recipe below). Prepare the sweetened whipped cream ahead of time. Line the bottom of a 9 x 3 inch round spring form pan with a layer of cookies (breaking a few cookies to make the fit). Spread 1/3 of the whipped cream evenly over the cookies repeating with two more layers and ending with whipped cream. Crush additional cookies and sprinkle on top of cake with milk chocolate chips. Cover cake with plastic wrap and refrigerate at least 8 hours or overnight (is best). Add the heavy cream, powdered sugar and vanilla extract to a large bowl or stand mixer, beat on high speed until stiff peaks form; set aside. Line the bottom of a 9 x 3 inch round spring form pan with a layer of cookies (breaking a few cookies to make the fit). Spread 1/3 of the whipped cream evenly over the cookies repeating with two more layers and ending with whipped cream. Crush additional cookies and sprinkle on top of cake and add chocolate chips. Cover cake with plastic wrap and refrigerate at least 8 hours or overnight (is best). Cook's Note: I don't recommend substituting cool whip for fresh whipped cream. Whipped topping (cool whip) contains oil and doesn't soak into the cookies making them soft enough. I also think it might be too sweet using cool whip. For my family; Oreo's will have to be the cookie of choice. I bet these would also be cute done in wide mouth canning jars for individual servings. I click onto the 'Print Recipe' button but nothing happens so unable to print out. The cake tastes great. Moderate sweet, soft and the chocolate just got weighed enough. Very tasty. 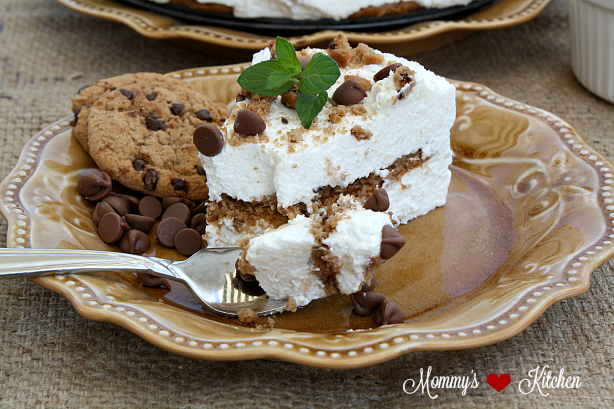 What a delicious dessert idea and perfect for Labor Day weekend! I definitely appreciate it being no-bake as well, since it is still extremely hot in our area of the country. I've never tried an icebox cake. This looks so simple that I have to try it. It looks delicious! Oh my, a big YES! I make an Ice box cake monthly but I use graham crackers. I love this alternative, thank you for the recipe. I am so excited to try this. Not only does that sounds delicious, it's absolutely beautiful. And you can never go wrong with chocolate chip cookies! I've never made a cake like this but it looks amazing and super easy! I might try it for our next family party! My kids would love me forever if I made up this chocolate chip ice cream box, seriously? It looks super sweet and tasty! Now this is a treat! It looks really pretty too. I'd love to prep one for a party. I've never heard of an ice box cake but it looks delicious. The best part is it's quick and easy to make. I bet my family would enjoy this recipe. I am thinking it would be a great addition to our Thanksgiving dessert menu as it's something the kids could make. Thanks for posting. 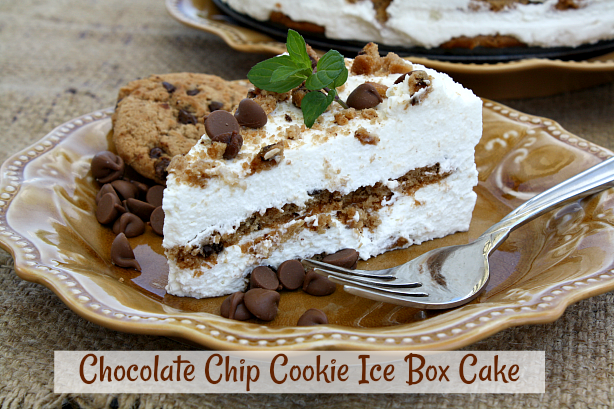 I adore ice box cake! I am going to have to make this one next week. It looks incredibly good! OH wow. What a delicious looking ice box cake! I love that you used chocolate chip cookies. That's such a yummy twist. I may experiment on this and try other kinds of cookies too. thanks for sharing! What a delightful treat. I am currently sipping my cup of coffee and it makes me want a slice of this lol. Oh my goodness!! 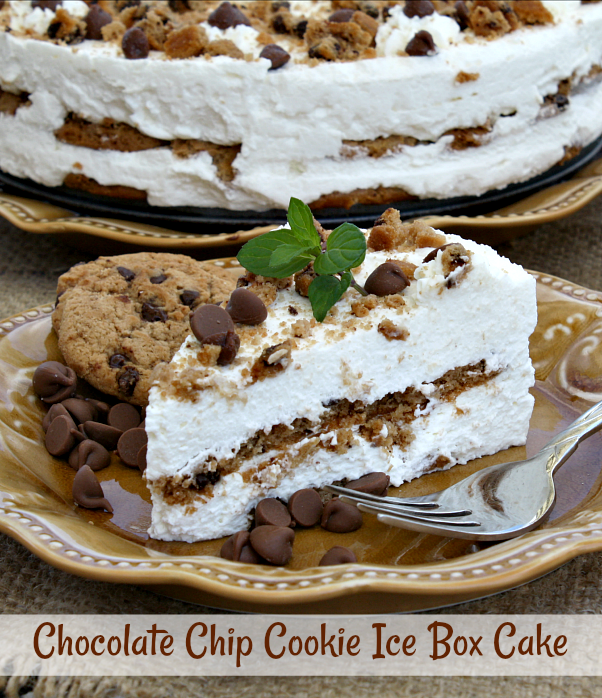 This chocolate chip cookies ice box cake looks so delicious and tempting. I will pinned this for a recipe. Yes, I've had an iced box cake and right know I want one, but no sweets for me unless it's fruit. This recipe is a bomb! I just broke my oven and I can't bake until my landlord changes it. I love that it is so easy to do! Definitely pinning for later. Wow that is one dreamy looking dessert. We absolutely love chocolate chip cookies so I can't think of a more suitable dessert to make.